I'm sort of in love with this idea, even though I don't like white chocolate and I'm not sure if I would actually be able to make mine look as pretty. Full directions at Hungry Happenings, complete with recipe for white molding chocolate. It actually appears to be a pretty simple recipe, so don't let my lack of confience in my chocolate molding skills deter you. Perfect for your next book-themed party, yes? Ha! Those are so cool. You could even use white cheese and a piece of ham, or something. Chomp!!! I'm all over it. Love this! Excellent! 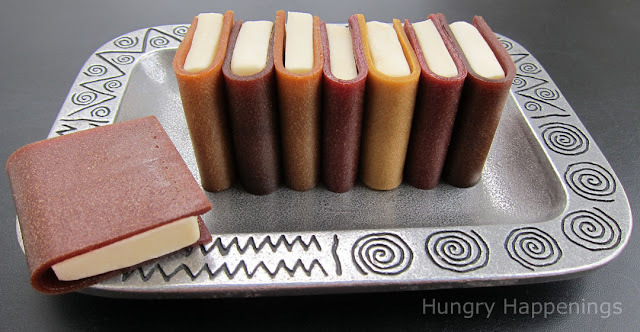 This is perfect treat to serve at a book club.